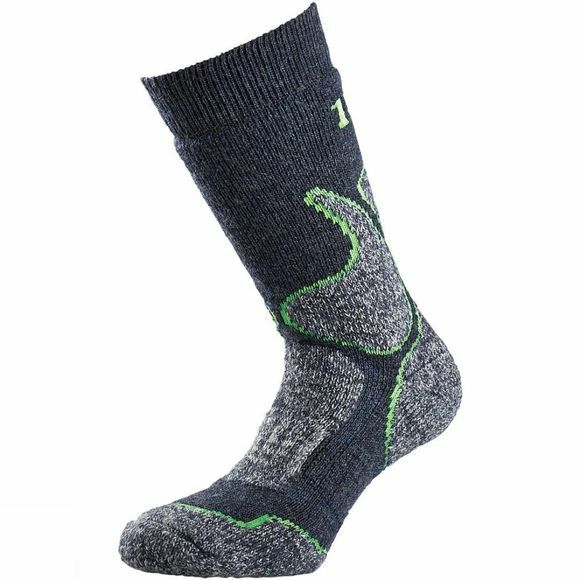 The 4 Season Walk Sock from 1000 Mile has a thick looped-stitched pile of soft merino wool to give you high volume and warm feet in even the coldest weather conditions. Carefully selected padded zones on the heels, Achilles tendon, ankle bone, mid-foot and toe areas offer complete protection and comfort. This sock is one of the thickest socks from the 1000 Mile range providing plenty of warmth and volume making it perfect for use in cold weather or with Wellington boots. This product contains Merino Wool: Merino wool is one of softest types of wool available and is perfect for regulating body temperature. The wool provides warmth without overheating the wearer and its moisture wicking properties combined with being slightly moisture repellent allow the wearer to remain dry.